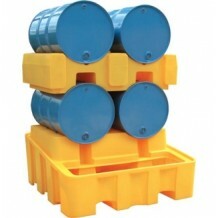 Our spill pallets or drum bunds are all made of fully recyclable, chemical resistant, UV-stabilised PE. Plastic is lightweight, easy to clean and can hold corrosive products (something a metal drum can’t). Our bunds are also compatible with most forklifts and pallet trucks. To make sure they are extra safe they exceed EU/UK and US regulations. Depending on what you would like store on them we do them in all different sizes and capacities. From a bund for four drums in one line to square surfaces. Most of our bunds come with platform, but we also have some bunds that can be used in combination with a euro pallet. The platforms have holes for pumps and inspection. If you don’t have space indoors and you would like to store you’re drums outside we also do spill pallets or bunds in the form of a shed. These are covered with a sliding door that can be locked. 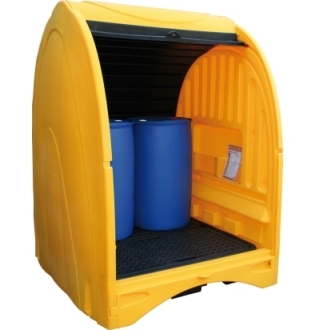 These ‘SpillShaks’ are rigid, double walled and made of chemical resistant & weather tight PE hardcover, for the storage of chemicals and hazardous waste. We also have a horizontal drum bund rack and a horizontal drum bund trolley. These are both to make the drum easier to use for dispensing and storage. The rack is stackable (2 on top of 2). The trolley or kart comes of course on wheels and with a strap to keep the drum in place when pushed around or put up straight. If you can’t find the right bund, spill pallet or work floor you’re looking for on our website, please give us a call because we have other solutions as well.